I’m excited to introduce one of my favorite bloggers, WIL, of Write Into The Light, who accepted my request to be a guest blogger today. I ran into the bedroom and slammed the door behind me; falling to the bed, I screamed into my pillow. He’s being unreasonable! He doesn’t understand. I can’t take this anymore! I thought. My husband and I just had a major fight, and my first instinct was to run away, literally – like from home, but I stifled that urge by going to the bedroom only. My next urge was to run away mentally by drinking or cutting, but I had come so far in my recovery I knew these were not options for me. So, I called a friend instead, but got her voice mail. Ugh! The emotions were boiling out of me; I had to give them release. They were drowning me, sucking me into an abyss of anger, sadness, fear, and pain. So, I picked up my pen and journal and began to write. I wrote in a frenzy anything that came to mind. The pen ripped through parts of the pages, my hand started to cramp, and I couldn’t see the words through my tears, but I kept writing until I could breathe again. Writing has always provided me with this type of emotional release. It helps me to sort through my thoughts and feelings, increases my focus, allows me to get to know myself better, and helps me to solve my problems by seeing them more objectively, literally in black and white. Dr. James Pennebaker, a researcher in Texas, has conducted studies that show that when people write about emotionally difficult events or feelings for just 20 minutes over three or four days, their immune system functioning increases. Dr. Pennebaker’s studies indicate that the release writing offers directly impacts the body’s ability to withstand stress and fight off infection and disease. 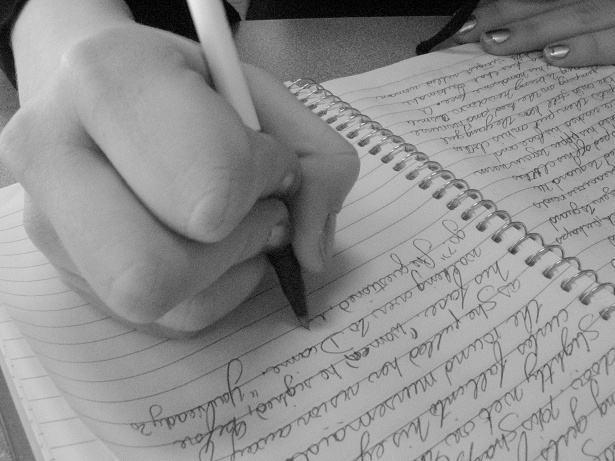 Other experts say that journaling can help people to manage anxiety, reduce stress and cope with depression by helping them prioritize their problems, fears and concerns; track symptoms day-to-day so they can recognize triggers and learn ways to better control them, and identify negative thought and behavior patterns over time. All of this is definitely true for me. I believe in the mental health benefits of journaling so much that it is the premise for my entire blog, Write into the Light. In addition to writing on my blog, I also keep a private journal notebook at home. No audience, no edits, no rules. Moreover, I don’t just journal during times of emotional turmoil. I also write to process through my days’ events, to list things for which I am grateful, to write letters that never get sent, and to pen poems. If you are interesting in journaling, but are not sure how to get started, I invite you to visit me at Write into the Light where I write about all things mental health, including a Weekend Mental Health Writing Prompt to help get you writing. I write and write. Scribbling emotions. Always try to write something I am grateful for. I do not destroy them. I agree that reading them over and over gets me stuck in the strong emotions. But, a couple times a year, I can see if anything has changed. Often, it hasn’t and I am amazed that I refuse to make progress. Sometimes I am blown away by what I have gotten through. And, sometimes I just flip back, looking for that awesome fudge recipe (I try to horizontally dash the page edges on the recipes) or funny thing my child has said. Or even, how mean someone has been to me and how long I let them before my notes helped realize this pattern and break it. Nope. I do not care how vile, silly, repetitive, or stupid the entries seem,I need to see that each day existed. ( Sometimes they all blur together and this really helps.) I would never destroy them. Sorry, didn’t mean to be anonymous! I am Creel Unbelove’d on face book! I wrote the above and love following Write Into the Light. I recommend you also check out the face book page called Just an Ordinary Girl. She tells it like it is and lets her emotional swings show. She has kids, works, and is witty, kind, and worth reading every day! Thanks, Creel Unbelove’d. I appreciate hearing more of what you write about. I like how you said you keep your entries because you “need to see that each day existed.” That says a lot to me. It seems to me to be very similar to the letter I’d never send. I’ve written several of them over the years, but then destroyed them when I finished. Heaven forbid if I’d actually sent some to the individuals they were meant for. Yes, Heaven forbid – lol. But, writing the letters did help you in some way I assume. There is something so therapeutic about it for me, sometimes more so than talking, I guess because it is tangible. Hi WIL! Great post here – I can feel the emotions jumping off the page in your memory of how you felt after that fight, and the pen ripping through your journal really drives it home. It is wonderful that you found something that works for you, a much better alternative to the other urges you have to fight! I’ve never been able to get into journaling. As a writer, I love the look and feel of a good journal, and growing up I had tons of them cluttering up my room and my desk. Each one would invite me in to write my life story – and then I would get an entry or two in and feel bored writing about myself. It would be tossed to the side until my next diary purchase. Now, looking back at those singular entries, I often giggle at the stories I felt compelled to tell in those early years, and wish that I had kept it up. To this day, I love journals, but I have accepted that journaling about my own experiences, thoughts and emotions is not something that I will do. However, I do fill them up now, with lists and other story ideas, snippets of thoughts ranging from the mundane to the thrilling to the obscure, little windows into my mind. And that’s enough for me. However, a few weeks ago, I started a “secret journal” with my daughters – they each have one, and we write notes to each other about how our day was, or questions we have or pictures, games – whatever they want to fill it with. They are both six years old, and I’m hoping we will carry this epistolary exchange forward for many years. It will give me the impetus to record bits of myself, as it will be for them, not for me. And I will cherish the bits and pieces of them that they share. By making it a community project, I hope it will work well for all of us, and fill that void that not keeping a journal leaves in a person’s ability to leave a paper trail legacy. And hopefully give me more insight into their thoughts and emotions and daily life as well, as they take the time to reflect on what they want to write. All that said, I popped over to your site to take a look at your weekend writing prompts (I am a HUGE fan of prompts!!) and I love what you are putting out there. Great ideas! I think journals can serve all sorts of purposes – that yours are “little windows into your mind” is perfect! I also love how you are using it with your daughters. Such a great idea! I’ve tried writing. It’s cathartic as I do it, but I find I can’t go back and read it. It’s just too painful/embarrassing/exasperating to see what’s been swimming around in my head down on the page. I end up journaling, hanging on to it for a year or so and then throwing it away. I envy you. it is the same for me also. the writing helps purge the emotions, restore calm, but i can never look back at the entries. they are too embarrassing and too awful to keep. i have to destroy them. I think what is important is getting the emotions out. No need to re-read or keep them. I completely understand and agree. I know what you mean about re-reading it. I don’t do it very often unless I am looking for patterns in my mood swings. I also don’t keep my journals for more than a year or so. I find that if I read over them too much I get stuck in the pain from the past and that is not good for me. It is better to write it and then forget about it for me.